Mark Horton does not work for, consult, own shares in or receive funding from any company or organization that would benefit from this article, and has disclosed no relevant affiliations beyond their academic appointment. Three British soldiers in the aftermath of the Benin expedition. Wikimedia Commons. The city was burnt down, and the British Admiralty auctioned the booty – more than 2,000 art works – to “pay” for the expedition. The British Museum got around 40% of the haul. None of the artefacts stayed in Africa – they’re now scattered in museums and private collections around the world. The 1867 British expedition to the ancient kingdom of Abyssinia – which never fully acceded to colonial control – was mounted to ostensibly free missionaries and government agents detained by the emperor Tewodros II. It culminated in the Battle of Magdala, and the looting of priceless manuscripts, paintings and artefacts from the Ethiopian church, which reputedly needed 15 elephants and 200 mules to carry them all away. Most ended up in the British Library, the British Museum and the V&A, where they remain today. 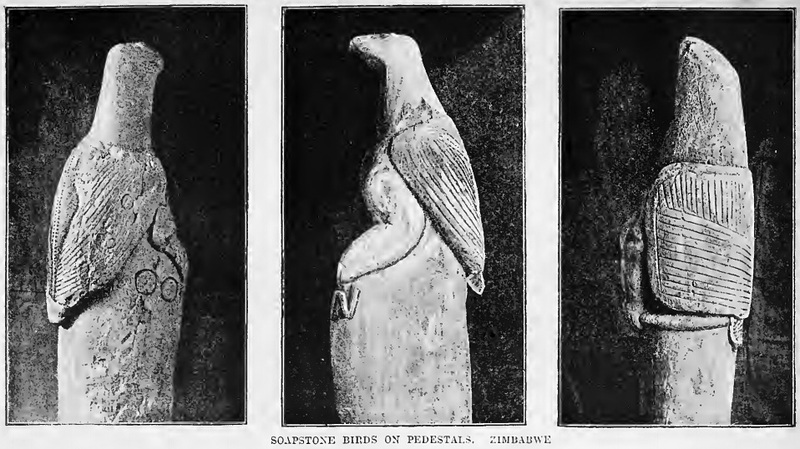 Zimbabwe’s soapstone birds, photographed in 1892. Wikimedia Commons. While these are the most famous cases, the majority of African objects in Western Museums were collected by adventurers, administrators, traders and settlers, with little thought as to the legality of ownership. Even if they were bought from their local owners, it was often for a pittance, and there were few controls to limit their export. Archaeological relics, such as inscriptions or grave-markers, were simply collected and taken away. Such activities continued well into the 20th century. Will the Musée du quai Branly, that great treasure house of world ethnography in Paris, which holds more than 70,000 objects from Africa, be emptied of its contents? Or the massive new Humboldt Forum – a Prussian Castle rebuilt at great cost to house ethnographic artefacts in Berlin which opens early in 2019 – be shorn of its African collections? There are already fears at the British Museum that a very effective campaign may lead to the return of its Rapu Nui Moai statues to Easter Island.